Victoria has a reputation as a fairly environmentally friendly city, and I’ve always thought people here seemed quite conscious of food waste. However, I’ve started to doubt that I assumed correctly. Upon moving to Victoria from Kelowna this September, I quickly integrated myself into the dumpster diving scene. Those who frequent the dumpster know that food is often thrown out due to minor cosmetic damage, hyper-sensitivity to expiration dates, packaging issues, or just laziness. Food that is no longer seen as marketable by retailers but is otherwise fine to consume often ends up in the trash. When I first started diving, I was amazed by the plethora of food I could find in my local grocery store’s bin. I found everything from bags of grapefruits, avocados, and berries to cartons of almond milk, bags of oats, and more bread than I could ever eat. But recently I’ve become upset when I crack open a green bin and see more produce than I can even fit into the back of my car. Why is all this food being thrown out? Who and what is allowing this to happen? Despite my general anger, a particular situation prompted me to write this article. You might be familiar with Mount Royal Bagel Factory. 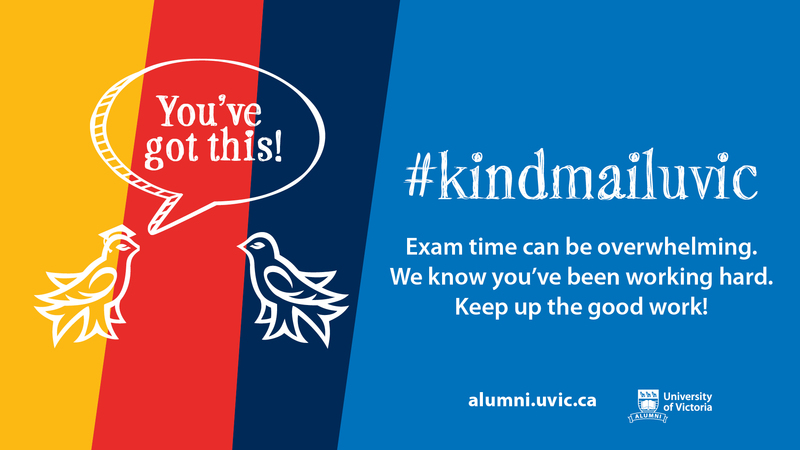 Located in Fernwood, and with stores in Kelowna and North Vancouver, this company makes delicious bagels. 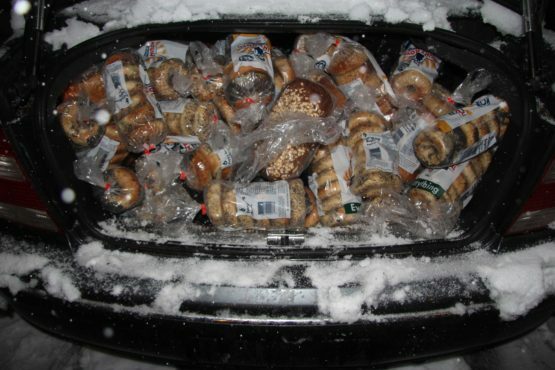 However, they throw out what seems to be around a thousand bagels every week. Mountains of bagels, Poppy Seed, Cinnamon Raisin, Everything, Multigrain, Whole Wheat, Plain: you name it. 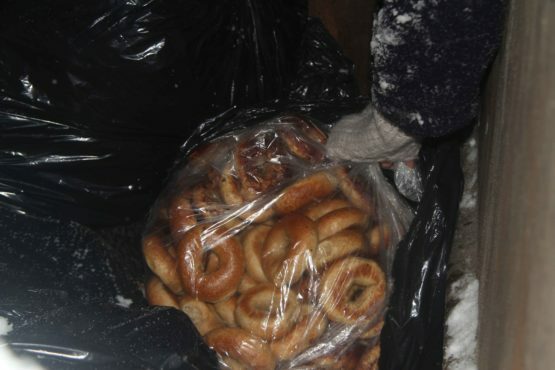 The bagels are likely only a few days old, and they are often bagged in groups of 6 or all double bagged in a large clear garbage bag, kept separate from other garbage contaminants. While free bagels are great, it frustrated me that such a colossal amount of food was being wasted rather than donated to community groups that could undoubtedly use it. Once food has been put into a dumpster, most non-profits like homeless shelters are unable to accept it for legal reasons. Technically, all businesses like Mount Royal had to do was stop putting their food in the garbage and I was sure groups would be happy to pick them up. Seemed like an easy fix. I called Mount Royal Bagels four times and, each time, I left my name, number, and a message offering to help them relocate their food waste. I was never called back. On my fifth call, the manager picked up. “If there is any waste, I makes sure it gets donated,” the manager assured me, after I offered my services to help relocate their waste and inquired about their waste management. He estimated that “90 per cent or higher” was the percentage of unsellable food they donated. Having seen the masses of bagels removed from their dumpster, I was very skeptical. When I inquired where they donate to, he stumbled and seemed unsure. He claimed to be unable to remember all the groups, but managed to name three: Vic High, SJ Willis, and the Jewish Community Centre (JCC). I followed up with these groups. SJ Willis School informed me that they did previously receive donations from Mount Royal, but that their partnership had ended a little while ago. Victoria High School let me know that they are very grateful to have a long-term, regular relationship with Mount Royal. However, a representative from Vic High confirmed they receive only 50–100 bagels per week. The JCC confirmed that they also received donations from Mount Royal — several dozen bagels per week were dropped off for their deli. Knowing what’s in Mount Royal’s dumpster, it’s easy to conclude that these donations do not constitute 90 per cent of their food waste. Even if they did, and what they throw out is the other 10%, that would put them at having around 10 000 excess bagels per week. Hard to believe. 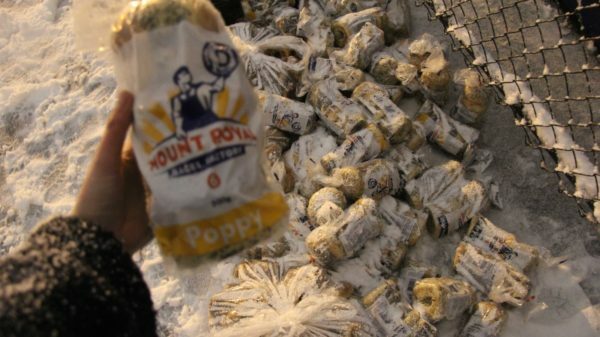 Mount Royal is far from being the only business that fails to make socially and environmentally conscious decisions when managing their food waste. Yes, Mount Royal is making some donations, but they are still throwing out a huge amount of edible food. They can and should do better. This is not an attack on Mount Royal, but an indicator of a broader societal issue. One third of all food produced globally goes to waste, with developed countries like Canada wasting up to half of their food. Large chain grocery stores such as Loblaws, Save-on-Foods and Safeway throw away unfathomable amounts of food daily, but it is compacted, locked, and inaccessible. It is next to impossible to hold them accountable for this injustice. Knowing what we know about the massive amounts of energy, water, and land required to produce food, we must be more responsible. We shouldn’t have to be dumpster diving. It’s time this system changed. No more waste and no more lies.